Hands up if you’ve had a sad veggie sandwich before. We sure have. While sandwich shops seem to be brimming with meat options galore, the vegetable side of the sandwich board usually comes up short. Cucumber slices and sprouts? Cute, but that doesn’t exactly get us excited. Give us a big, epic, juicy veggie sandwich that’s loaded with flavor. One that’s a wee bit messy, but totally worth rolling up your sleeves for. Is that too much to ask for?! We don’t think so. After a lot of searching the most obvious answer was to make our own. 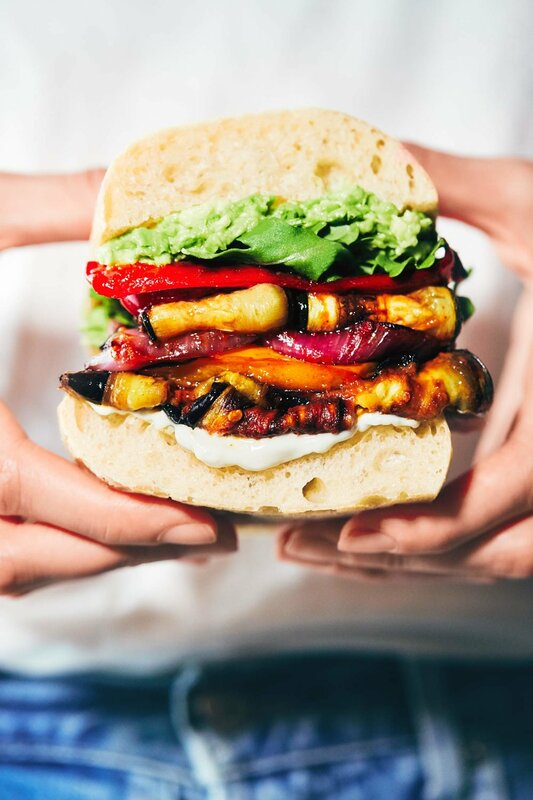 And this Roasted Veggie Sandwich totally delivers. Lately we’ve been pretty obsessed with Peri Peri Sauce, which is a deeply flavorful sauce that originates from Africa. It’s tangy, citrusy, garlicky and turns whatever you brush it on into magic. Ever been to Nando’s? That sauce. In this case, Peri Peri Sauce does wonders with roasted vegetables. Like so good we need to stop ourselves from eating the whole batch directly from the pan. For this sandwich, we like to roast the vegetables long enough to develop a nice char on their edges. It helps mimic some of the flavor and texture you’d get on the barbecue, without needing to step outside. The last step to roasting the veggies is to slather them with Peri Peri Sauce. It them to a whole other level… caution... you may only want to make them this way ever again. When it comes to the Peri Peri Sauce, we prefer making it at home because it gives you complete control over how spicy it is. We most enjoy when the sauce has a mild heat - enough to keep things exciting - but doesn’t blow your head off (and trust us, some store-bought versions have that power). You can find the recipe to our Easy Peri Peri Sauce here. It’s a cinch to make yourself, so we highly recommend it. You can easily whiz it up while the vegetables are roasting in the oven. But if you prefer store-bought, go right ahead! 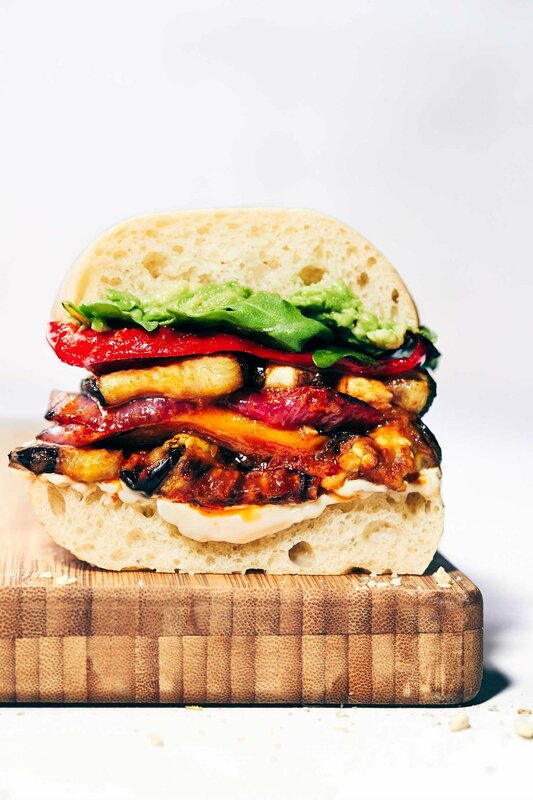 Assembling the rest of this sandwich is pretty straightforward, since the roasted peri peri vegetables are definitely the star of the show. You’ll need enough bread for four sandwiches. We recommend ciabatta or focaccia, but other types of buns or bread would be suitable as well. A smear of mayonnaise (vegan, if desired) helps make the sandwich extra lucious. Avocado, because it’s always a good idea. We like to mash the avocado so it gets in all the nooks and crannies, but you’re probably also an avocado expert (who isn’t?! ), so we’ll leave you to decide. A small handful of arugula provides a nice fresh, peppery contrast. And just like that, you’ve assembled a pretty perfect sandwich! This combo is always a hit with friends and family - nobody misses the meat. For easy entertaining, you can roast the veggies in advance and just heat them up to serve. And bonus points for letting guests assemble their own sandwiches at the table. Simply have the toppings set out in bowls - less work for you! If you somehow have any leftover veggies, we’d recommend adding them to salads, bowls or even pizza. Or, eat them cold, straight out of the fridge like we do. Yes, they’re that good. Cut zucchini, eggplant, purple onion into ¼-inch thick slices. Cut each bell pepper into quarters (removing the stem). Spread the vegetables out across the two lined baking sheets. Generously brush with oil on both sides. Sprinkle with salt and pepper. Bake for 15 minutes. Remove from oven, and flip the vegetables for even browning. Bake for another 10 minutes, or until the vegetables develop crispy brown edges. Depending on how evenly you cut your vegetables, some may cook faster than others - so keep an eye on them and remove earlier if needed. Brush a generous amount of Peri Peri Sauce over both sides of the vegetables. Return to oven for a final 3-5 minutes. To assemble the sandwiches, warm bread (in oven) if desired. Spread some vegan mayonnaise on the bread, then top with roasted peri peri vegetables. Top with avocado slices and arugula. Enjoy!